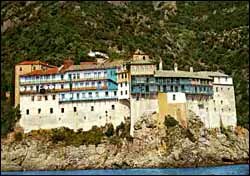 It is built on a beautiful location at the south-west side of Mount Athos and is dedicated to Saint Nicholas. The monastery was founded in the 14th century. It occupies the seventeenth rank in the hierarchical order of the twenty Athonite monasteries. It is considered to be one of the most well-organised and strict coenobitic monasteries. It is inhabited by 70 monks (1990). Its katholikon was built in 1768, in accordance to the Athonite plan. The church's walls were decorated in 1779 by the holy monks Gabriel and Gregory from Kastoria. The Church's narthex (vestibule) was added later. Aside from the katholikon, the monastery also features many chapels. The library is relatively poor since it was destroyed by raids and fire during the revolution of 1821. Today, it features 297 manuscripts and 4,500 printed books. The monastery also features a fragment of the True Cross and relics of saints.